After being drafted three times and not signing, Bill Bonham was not drafted after his senior season at UCLA. Bonham eventually signed a free-agent contract with the Chicago Cubs. Less than a year later, the 6-foot-3 right-handed pitcher was in the major leagues. Bonham, who was born in Glendale, California, was raised in the Pacoima neighborhood in the northern San Fernando Valley of Southern California. After his senior season at Francis Poly High School, when he earned second team All-East Valley League honors, he was selected in the 31st round of the June 1966 amateur draft by the California Angels. Bonham opted to attend Los Angeles Valley College and was drafted again by the Angels before his freshman season started. He was selected in the fourth round of the secondary phase of the January 1967 draft. Bonham again turned down the Angels and pitched two seasons for Los Angeles Valley. As a sophomore in 1968, he had a couple of standout performances. On March 16 he struck out the first nine hitters he faced and finished with a school-record 20 strikeouts in a 3-2 victory over Santa Monica. On April 10 he pitched a no-hitter and struck out 18 in a 1-0 victory – and scored the winning run in the bottom of the ninth – over L.A. Pierce. In 67⅓ innings that season, he struck out a team-record 88 batters. After the season, Bonham was drafted again when the Baltimore Orioles selected him in the 31st round of the June 1968 amateur draft. Bonham turned the Orioles down and enrolled at UCLA. In 1969 Bonham helped the Bruins earn their first berth in the College World Series. The UCLA team, which included future major leaguer Chris Chambliss, went 42-10-1 in the regular season and took a 13-game winning streak into the College World Series, in which they were winless. In his senior season, Bonham earned the team’s pitcher award, winning four games with a 2.60 ERA while striking out 110 in 82⅔ innings. After going undrafted in June, he signed with the Cubs for a $2,000 bonus. Bonham made his professional debut with Huron (South Dakota) of the Class-A Northern League. In 18 games, he was 3-3 with six saves and a 3.00 ERA. In 39 innings, he struck out 69. In December the Cubs announced that Bonham would be invited to 1971 spring training as a nonroster player. Bonham took advantage of the opportunity and caught the attention of manager Leo Durocher. On March 21 he pitched four scoreless innings against the Milwaukee Brewers, which all but clinched a spot on the Cubs roster. The outing was his second in a row of four shutout innings. Bonham made his major-league debut against the St. Louis Cardinals on April 7, in the second game of the season. He entered the game in the top of the fourth inning, with two runners on, none out, and the Cardinals leading 6-0. He walked the first two hitters he faced and then gave up a two-run single to the next hitter. After issuing another walk, Bonham was replaced. On April 18 Bonham made his first start, going 3⅔ innings in an 8-1 loss to the Giants in San Francisco. Over the next 24 days, he made just two relief appearances (April 23 and May 9) and on May 13 he was optioned to Tacoma (Pacific Coast League). He had pitched in five games and was 0-1 with an 8.44 ERA. Two days after being sent to Tacoma, Bonham picked up a victory in relief in an 8-7 victory over Portland. In three weeks at Tacoma, he appeared in eight games (11 innings) and was 2-1 with four saves and a 2.45 ERA. The Cubs recalled him on June 3. Bonham picked up his first major-league victory on June 17, pitching three shutout innings in the Cubs' 7-6, 10-inning victory over the Cardinals in St. Louis. For the season he was 2-1 with a 4.65 ERA in 33 games. In his second spring training with the Cubs, Bonham wasn’t quite as impressive as when he was a rookie in 1971, and was the final roster cut before the season started. Bonham was optioned to Wichita (American Association), where he was solid as a starter. On April 28 Bonham pitched a one-hitter in the Aeros' 2-0 victory over Indianapolis. Less than two weeks later, he threw another one-hitter in Wichita's 2-0 victory over Oklahoma City. After going 10-4 with seven complete games and three shutouts in 18 starts, Bonham was recalled by the Cubs on July 17. On July 21, he started and went seven innings in the Cubs' 11-3 victory over the Astros in Houston. He made three more starts, but for the rest of the season was primarily used as a reliever. He was 1-1 with a 3.12 ERA and four saves in 19 appearances with the Cubs. 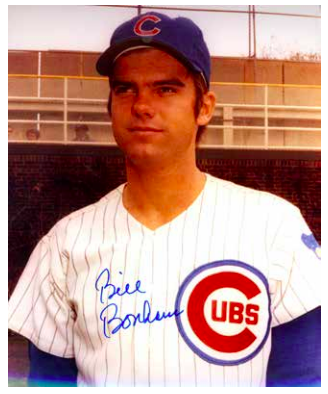 Bonham stuck with the Cubs for good in 1973. He was used as a spot starter and reliever. His 44 appearances included 15 starts (and three complete games) and six saves. Bonham had a solid spring in 1974 with a 2.86 ERA and was named the Cubs' Opening Day starter. At Wrigley Field on April 9, Bonham pitched his first career shutout, a four-hitter in a 2-0 victory over the Philadelphia Phillies. But it would turn out to be a long season for Bonham and the Cubs. Bonham's second victory didn't come until May 12. A loss to the Padres on June 18 dropped his record to 4-10. But between June 23 and July 18, Bonham pitched well, going 5-1 in seven starts to improve his record to 9-11. Then he won just 2 games and lost 11 over the final 2½ months of the season. On September 20 in St. Louis, Bonham allowed five runs in four innings in a 5-2 loss to the Cardinals. The loss was his 20th of the season. Bonham finished with an 11-22 record and a 3.86 ERA in 44 appearances (36 starts and a career-high 242⅔ innings). He had 10 complete games, among them two 1-0 losses, a 2-0 loss and two 2-1 losses. The Cubs, who were 77-84 in 1973, were 66-96 in 1974. "When I pitched badly I lost," said Bonham, "and when I pitched good, I lost some of those games, too. For a while, it seemed it didn't make any difference how I pitched. I didn't get much in the way of results. It's an unsuccessful thing to lose that many games and it makes you feel like a failure. It's tough to digest 20 losses. But I try to look at the other aspects. I got a lot of innings in. I picked up a lot of experience. Bonham was one of three 20-game losers in the National League in 1974. Randy Jones and Steve Rogers were the others. There were two 20-game losers in the American League, Mickey Lolich and Clyde Wright. Bonham and the Cubs showed improvement in 1975. He was 13-15 with a 4.71 ERA. In his 36 starts, he had seven complete games and two shutouts as the Cubs improved to 75-87. In 1976 Bonham was 9-13 with a 4.27 ERA in 31 starts. The 1977 season was the first in which Bonham was used exclusively as a starter. After beating the Padres 10-5 in Chicago on August 6, he was 10-10. But the victory was his last of the season. Over the final seven weeks of the season he made eight starts and went 0-3. For the season, he was 10-13 with a 4.36 ERA in 34 starts. After the season Bonham asked to be traded, because he “felt a change of scenery might him turn around a career that has been a disappointment to him.”5 And on October 31 the Cubs obliged, trading him to the Cincinnati Reds for veteran pitcher Woodie Fryman, minor-league pitcher Bill Caudill, and cash. Bonham got off to a good start with the Reds in 1978, winning his first seven decisions before suffering his first loss on June 12. His second start of the season was a 12-3 complete-game (his only one of the season) victory over the San Francisco Giants in Cincinnati. Five days later, he pitched into the ninth inning of an 8-2 victory over the Dodgers in Los Angeles to improve to 3-0. After that outing, Bonham experienced discomfort in his elbow, and was sidelined for four weeks. Bonham returned to the mound on May 12, when he took a shutout into the seventh inning and combined with Paul Moskau to beat the Philadelphia Phillies, 3-0. After a no-decision on May 17, he and Pedro Borbon combined to shut out the Braves, 10-0, in Atlanta, on May 22. On July 7 Bonham improved to 9-2, allowing just one run and striking out seven in 6⅔ innings in a 2-1 victory over the San Francisco Giants in Cincinnati. But then he was sidelined again because of discomfort in his elbow. After a month on the sidelines, Bonham returned on August 6 and allowed one run in five innings (with no decision) in the Reds’ 3-1 victory over San Diego. Back-to-back losses in August dropped Bonham’s record to 9-4. He earned his 10th victory (6-3 over the Astros in Houston) on September 4 and 11th (6-3 over the Giants in Cincinnati) on September 9. On September 14, he allowed four runs in 5⅓ innings in an 8-1 loss to the Padres in San Diego. It was Bonham’s final outing of the season, which saw him go 11-5 with a 3.53 ERA. He didn’t have a shutout, but he combined with relievers on four occasions for shutouts. Bonham was able to open the 1979 season in the Reds’ rotation – the number 2 starter behind Tom Seaver. His first start of the season was a no-decision; he allowed two runs in seven innings in a 4-2 loss to the San Francisco Giants. After his second start, a 4-2 victory over San Diego, Bonham experienced stiffness in his right shoulder and was sidelined for three weeks. He made his next start on May 6, going just three innings in the Reds’ 17-5 victory over the Houston Astros. After giving up four runs in the first inning, Bonham pitched two scoreless innings before being removed because he had thrown 65 pitches. After going six innings (a no-decision) in his next start, Bonham was in the rotation the rest of the season. He made 29 starts, going 9-7 with a 3.79 ERA. But heading into spring training in 1980, there were some lingering issues for Bonham. Bonham opened the 1980 season in the starting rotation. In his first outing, on April 12, he went 6⅔ innings with no decision in a 5-4 victory over the Atlanta Braves. A week later, he got his first victory of the season, allowing four hits and one run in a 6-1 victory over the Braves. But in his third start, Bonham retired just one of the seven hitters he faced and allowed five runs in a 7-1 loss to the Cubs. That was Bonham’s last outing for two months. In mid-May he was placed on the 21-day disabled list. After rejoining the Reds, on July 26 he went five innings and teamed with reliever Tom Hume for a 5-1 victory over the New York Mets. It was his final major-league appearance. Six days after the victory over the Mets, Bonham was scratched from a start against the Phillies after he experienced pain in his right shoulder. He returned to the disabled list. He was reactivated in September but did not pitch. In his abbreviated season, four appearance, he was 2-1 with a 4.74 ERA. A month after the surgery, Bonham, his wife, and Hume and his wife were staying at the MGM Grand Hotel and Casino in Las Vegas, when the hotel was devastated by a fire. About 1,000 people were rescued from the rooftop. The blaze, one of the worst hotel fires ever in the United States, claimed 85 lives, 75 from inhalation. Recovering from the shoulder surgery, Bonham was optioned to Triple-A Indianapolis at the start of the 1981 season. In early June, a week before the major-league season was halted by the players strike on June 12, the Reds recalled Bonham and placed him on the disabled list. During the strike, he worked out in Cincinnati, throwing a simulated game every fifth day. In July Bonham was sent to Indianapolis on a 20-day rehabilitation assignment. But in late August, Bonham, who was in the final year of a four-year contract, was released by the Reds. Bonham continued working out in the offseason and was invited to spring training by the Reds in 1982 on a conditional basis. He was one of the surprises of spring training for the Reds and battled Mike LaCoss and Charlie Liebrandt for the fifth spot in the Reds’ rotation. When the Reds announced their regular-season roster, they said Bonham would remain at their minor-league complex in Tampa. Five days later Bonham was scheduled to start against Oklahoma City but was scratched because of a sore arm. On July 9 the team announced that Bonham had returned to his home in California. His playing career was over at the age of 33. Bonham spent parts of 10 seasons in the major leagues, going 75-83 with 11 saves and a 4.01 ERA in 300 appearances (214 starts). He had four shutouts among 27 complete games. In parts of six minor-league seasons, he was 17-9 with 10 saves and a 3.25 ERA in 52 appearances. He struck out 227 in 216 innings. Bonham worked as a roving minor-league pitching instructor in the Houston Astros organization for several seasons. After that, he helped his wife run a boutique in the Southern California coastal town of Solvang. This biography is included in "20-Game Losers" (SABR, 2017), edited by Bill Nowlin and Emmet R. Nowlin. In addition to the sources cited in the Notes, the author also consulted Baseball-Reference.com, milb.com, and retrosheet.org. When contacted in May of 2017, Bonham politely declined to speak about his career. 1 Earl Lawson, “Father-Critic Finds Little Fault With Reds’ Bonham,” The Sporting News, May 6, 1978: 9. 2 George Langford, “Cubs Rookie ‘Wings’ Way Toward North,” Chicago Tribune, March 22, 1971: C2. 3 George Langford, "Bonham Optioned; Cubs Get Newman," Chicago Tribune, May 14, 1971: C4. 4 Jerome Holtzman, "Bonham Spots Light Beam in 22-Loss Season," The Sporting News, October 26, 1974: 18. 5 Richard Dozer, “Caudill Seen as Gem in Cub Future,” The Sporting News, November 19, 1977: 48. 7 Earl Lawson, “Seaver’s Slump Has Reds ‘Concerned,’” The Sporting News, May 13, 1978: 19. 8 Earl Lawson, “Reds Fire Away With BBs – Bonham and Bair,” The Sporting News, June 10, 1978: 8. 10 Earl Lawson, “Foster Swung More, Connected Less in 78,” The Sporting News, October 14, 1978: 36. 11 Earl Lawson, “Keystone No. 1 Question for Reds,” The Sporting News, February 9, 1980: 38. 12 “Caught on the Fly,” The Sporting News, November 15, 1980: 59. 13 Earl Lawson, “’God Was Watching,’ Says Grateful Hume,” The Sporting News, December 20, 1980: 47. 14 Earl Lawson, “Reds: Bonham’s in Trim,” The Sporting News, August 1, 1981: 37. 15 Wire services, "Bonham's Stock Takes a Plunge," Richmond (Indiana) Palladium-Item, March 29, 1982: A5. 17 “Bill Bonham Signs,” Indianapolis Star, June 28, 1982: 23. 18 David Knight, "Birds Use Their Free Tickets," Indianapolis Star, July 3, 1982: 26.